One of the principles of Waldorf education is that students learn history through biography, so that the history comes alive. 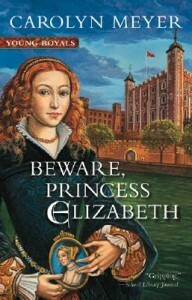 In Beware, Princess Elizabeth, we have a great children’s book that does just that. In a very real and dynamic way, we as readers get to understand the Tudor family that once ruled Britain. Personally, I love reading historical fiction when it is packaged in a children’s book that is told from the first person point of view. It makes me feel as if I am watching history unfold. As with all historical fiction, it is sometimes difficult to know how much is real and how much has been added by the author. At the same time, it’s not really the details that we want our children to carry forward; rather, history is about understanding the human predicament, and what motivates the actions of leaders. In this children’s book, we get a very good look at the way power can corrupt even the best of people. As with many of the royal personages, there are some unfortunate turns of the wheel — beheadings, imprisonment, and more. Nevertheless, this book is a great addition to any classroom studying the time period. It is also fun just to read for it’s own sake, as an exciting drama.